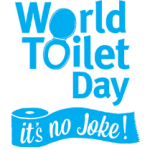 Sydney Plumbing Services » Make a difference during World Toilet Day 2017! Make a difference during World Toilet Day 2017! Did you know that some people must do without a toilet? In the West, we’re so used to sitting on one when we go for a number two. If the toilet runs smoothly we won’t even think about it. We take it for granted. But sitting down for number two in comfort and style is a luxury many simply cannot afford. And we’re not talking about having shiny porcelain toilets with fancy fixtures. They have no toilets–be it porcelain, wooden or metal one. NONE. So, where does the poo go? Well, that’s why you just have to hear about the important World Toilet Day 2017 or WTD2017 for short. You see, when you reclaim your throne, billions of people must wing it so to speak and take a dump wherever possible. Their toileting might happen anywhere. In the woods behind a tree, under a bridge, or in some fenced in backyard. And, we’re not talking about an emergency where you find yourself driving past midnight hour with your girlfriend, and suddenly you must go. Of course, those things happen. But imagine having to plan, search and hunt for squatting space every time you need to take a dump! Well, consider this. According to WHO/UNICEF (2017) a whopping 4.5 billion people either have no toilet or no working toilet. About 869 million people worldwide practise open defecation because they have no proper toilet! But, it gets worse. A shocking 1.8 billion people drink water that has no protection against contamination from faeces. So, the question ‘where does the poop go?’ becomes a serious issue. Because every time the poop is no disposed of properly it may enter the ecosystem and end up in a drink water reservoir! So, feel lucky the next time you take a sit on your comfortable porcelain, and you don’t have to use grass or leaves to clean yourself! Most importantly, be sure to spread the news about the WTD2017. Thankfully, we have the World Toilet Day 2017, it puts things into perspective a little, doesn’t it?